My baby girl has her first loose tooth! Kindergarten and a loose tooth all in one week. WOW!! 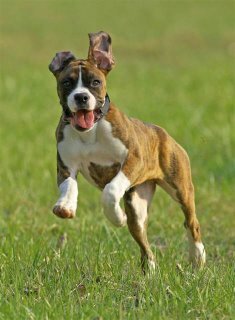 Boxer of the Day - action shot! 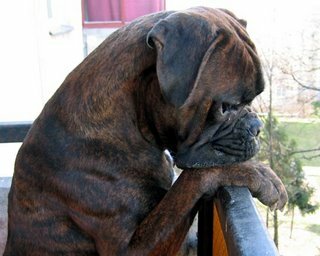 Thursday's boxer of the day is a great advertisement for why I'll leave the ears alone. How cute are floppy ears!!! I'm submitting my query and first page to Miss Snark's Crapometer tomorrow. She has a 12 hour window for accepting entries and then chooses her favorite 100 to filet on the blog. I'll let you know if mine's been chosen. If not, I think I'll go ahead and submit to Evil Editor. I've held off on EE's services so far because I'm really not at the querying stage, but I the Crapometer only comes along every so often so I polished mine up and am putting it out there. The title of this local news story is Psycho Killer Racoons Terrorize Olympia. I don't think it needs any more of a plug than that. Those first four words together in one sentence pretty much have me hooked!! This is a very special boxer because it belongs to my Aunt. I haven't met this little sweetie in person (yet) but can't wait to!! How cute is that face?! This particular color combo is called "Flashy" because of the "flashes" of white on her chest. Motorists - Where have all the drivers gone? Don’t fall into the DMV Handbook trap. Plunge, Plummet - Ever notice that nobody just falls anymore? Newton’s Law applies. No matter what word you use, you hit the ground just as hard, so keep it simple. White Supremacist - Putting aside its obviously non-conversational tone, “white supremacist” sounds too lofty. It’s more than those lowlifes deserve. Most of them probably don’t even know what “supremacist” means. It’s also inherently racist. Somehow we never use “supremacist” without “white” before it. Violent radicals of different hues tend to be called “separatists”, as if no member of any non-white race would dare think in “supreme” terms. I just saw Why We Fight. It's terrifying. I saw Farenheit 9/11 and was able to dismiss a lot of it as Michael Moore being Michael Moore (I think he's pretty irresponsible with his facts in order to make his points). This movie isn't something you can dismiss. What I found really troubling was how the private sector that manufactures weapons is so integrated with the government - now we have contractors doing the work of military - it's just peeling potoates and shining shoes now but it's a scary trend. They also talk about how an aircraft carrier is sold. And did you know that a piece of the B-52 is built in every state in America so that if the government tries to discontinue these there will be outcry? Here's a good sound bite "when war becomes this profitable, you're sure to see more of it." I'm not saying there aren't just wars. I'm not saying that I wish Saddam were still in power - I think he was horrible - but the term "power corrupts" seems very apt after watching that film and it seems that the locus of power is in wealthy corporations more than anywhere else. The Corporation is another good film talking about corporations being the new United Nations. Comments welcome - I'd particularly like to know how some of you reconcile your feelings about any good outcomes from a war that may or may not be just. For example, I've heard people say that of course Saddam was bad and it's good that he's gone but that the war in Iraq was still unjust. So, the word count meter hasn't moved in a few days. My characters ran off and did some things that weren't in the outline and I have to regain control. It's all good, but I hate to not see that meter moving forward. Stay tuned! So, no boxers over the weekend. 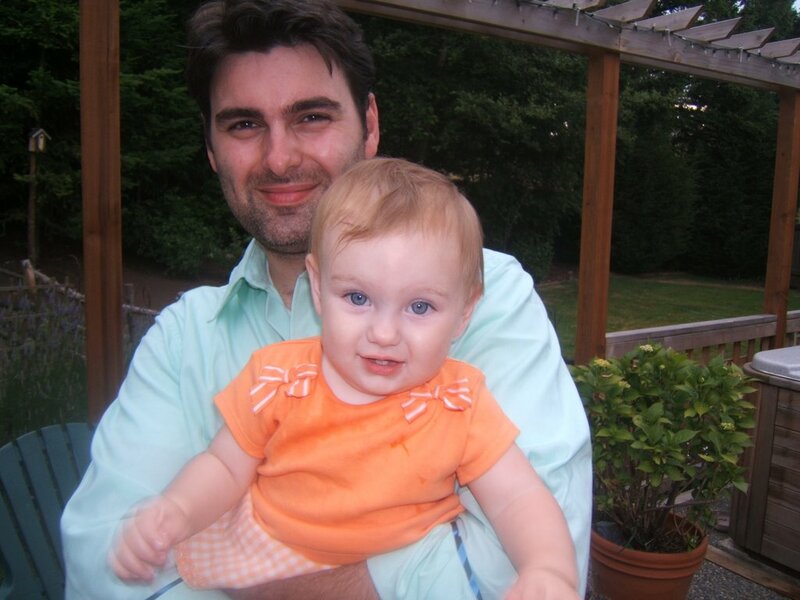 I tried, but Blogger was having issues uploading photos, so I'll give you a twofer today. 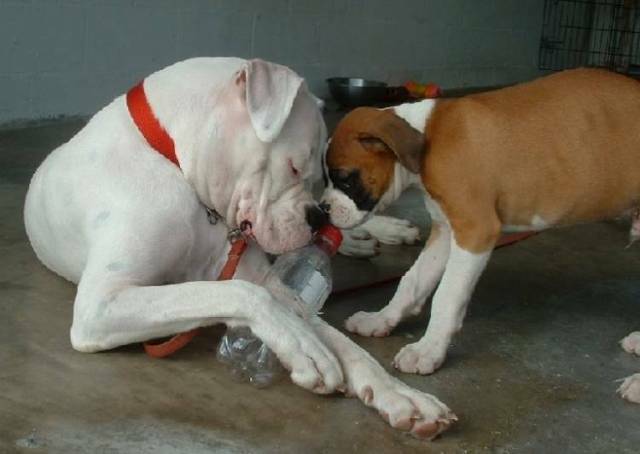 :) Needless to say, Boxers like to play with other boxers. I'll just add that I took an unexpected detour on Sunday to Greenlake, aka "Dog Mecca" and I was treated with seeing two, yes TWO, boxers being walked right past me. They were identical brindles with white stripes down their noses and on their chests with floppy ears. Ahhhh....!!! 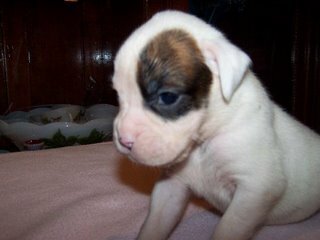 Much like the fawn boxer in this photo, but brindle where this one is fawn. 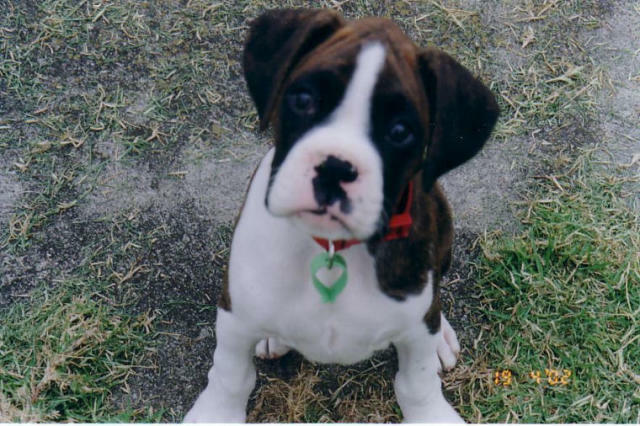 For today's Boxer of the Day we have this little beauty, a brindle flashy looking very inquisitive. Notice the natural ears. 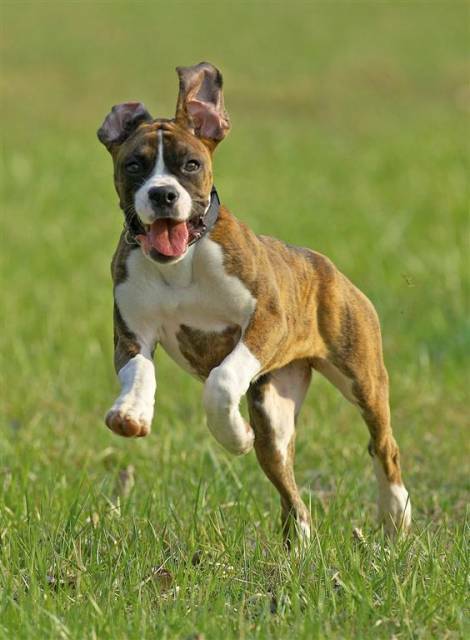 Boxers have traditonally had their ears cropped so that they stand up straight. I just learned that this was because they were bred to hunt and hold wild boar. It was very likely that the boar could rip an ear, which would have been a very serious injury before 24 hour emergency vets. Now that they don't hunt, people are leaving their ears floppy which I love. I hope you're all enjoying this new blog feature. The "find a boxer" quest continues. I've found 2 potential breeders in British Columbia and one right here near me. I'm creating my list of breeder questions and the investigation begins!! 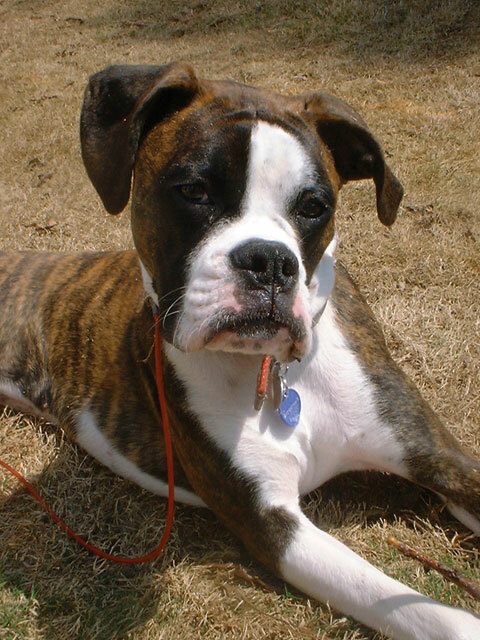 This sweetie is a brindle boxer. It looks like she's waiting for her friends to come over and play. Don't you just want to give her a cuddle?! Another party in the blog!!!! Check out that word count, baby, I'm halfway done! Just for fun, let's do a little word count recap. I picked the novel back up this year with 17,000 words done. I beat my head against the keyboard for the next 6 months and in mid-June had a whopping 21,000. Now, two months later, I'm at 45,000. Seriously, how cute is that. So the scoop on white boxers is this. First of all they are not albinos - as you can see with this little beauty, they often have a spot here and there and certainly have pigmentation even without spots. White boxers on the other hand are not bred to be white because they have a higher tendency toward deafness and blindness. I don't know if this was just bred in along with the color like the willfullness in the shepherds, but the incidence is high enough that it is considered irresponsible to breed specifically for the white color. 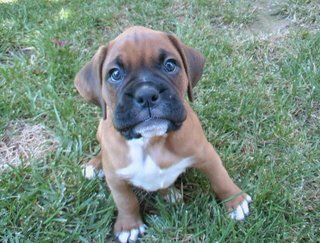 That said, a boxer can be shown with up to 25% of white on it's body - breed two of those dogs together (they're called Flashy when they have white on them) and you're likely to get an all white boxers. Sadly, these used to be euthenized (the horror), but now are more often sold to pet homes. So long as they are not born deaf or blind, their health is not compromised by their color in any way and they make fantastic pets. Sesame Street has a new fairy-in-training! Our household is very excited about the new addition! Welcome, Abby Cadabby!! I can't explain it but I've suddenly become obsessed with boxers. Those who know me might not think this is completely out of the realm of what's normal for me, but I assure you - this is another level, completely above and beyond my normal puppy obsession. 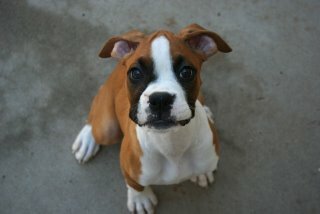 Here is my boxer picture of the day. There will be future boxer pictures as I try to hold on till I can buy my own. I went to pick up a few books for Kira to enjoy her last few days of summer with late nights staying up reading. Soon I'll be enforcing bed time and getting her up early for breakfast... but not just yet. So, I decided to try a chapter book series for her. I think The Magic Tree House is a little beyond her and I don't love Junie B. Jones, so I found Nate the Great. We love Nate! Here's why he's so great - I'm admit to being a little bit of a literary snob. I love genre fiction and fun reads but if the prose is bad I can't get through it. So many kids books keep the sentences short and simple, but I worry that it's hacking away at the part of their brains that develops a literary sense of style and that they'll never learn proper sentence composition if they're reading stilted, cropped sentences. The beauty of this series is that the sentences are short and simple, but it's in the style of the hard boiled detective, so it works. Nate is a miniature Sam Spade. The whole book is fun to read, firmly rooted in a literary style, and endearing. "Where is Fang?" I asked. 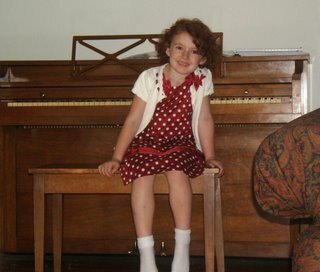 "He ran away," Annie said. "Now you have a new case," she said. "Nate the Great Finds Fang." I, Nate the Great, did not want to do that. Fang's teeth get bigger every day. "Nate can't solve cases today. This is his day off." "I will teach all of you how to be a detective. I will teach you how to find Fang. Come in." I, Nate the Great, said to Annie, "First you have to remember. Remember if there was anything different about Fang today. Any reason why he might run away. Then remember where you last saw him. Remember what he was doing. Remember who was there." Annie said, "I got Fang ready for the party. I didn't have time to give him a bath. So I feather-dusted him." "Yes. It makes his fur nice and clean." Robin got promoted today. WOOO!!! It's been a while since I've posted some pics of the kids and I know I have friends and family viewing the blog... so here are some udates. 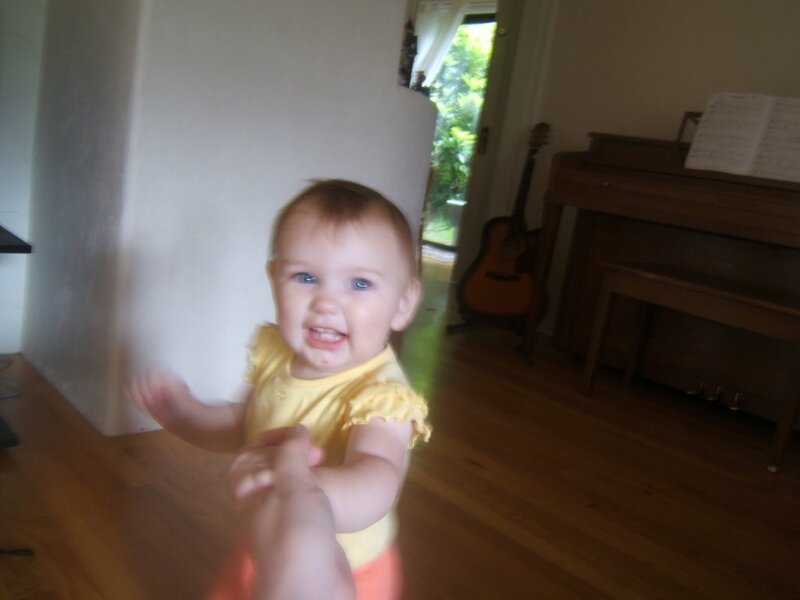 Miss Greta just turned 11 months old last week and has been walking for about 2 months now. She can stand up without holding anything, pivot, sit down and get back up, and do most of the intricate walking maneuvers. She still only goes about 10 feet at a time, but she's finessing it. Miss Kira starts Kindy in exactly one month. (Picture of her in a uniform coming soon!) We're all very excited and I keep having to remind myself that I'm not going with her. She's enjoying these last days of summer with abandon before she starts the great adventure that is school. ... 4th of July - can you see the attitude in that girl? Agent Kristen tells us today how a killer query letter (and of course a good manuscript to go along with it) got her brand new author from sending a query to receiving a contract from Bantam in TWENTY FIVE DAYS! She links to her new author's blog where she posts the query letter for the rest of us to learn from. I think lore has it that Stephen King was rejected 75 times or something atrocious like that and this lady hooked an agent and sold her book in less than a month. I know I'm feeling better about the world of publishing today! I'll sum up for those that don't want to read the whole story, here. The bottom line is that according to the UK's Dailymail, cell phones have more bacteria than toilet seats and you should swipe them regularly with antibiotic wipes. Three guesses as to what I did just before typing this post. More bacteria than toilet seats... think about holding one of those up and talking into it. EWWW!!! Doing an image search on Google for "white boxer" doesn't just bring up dogs. Who knew they came in see through mesh?! It's set in 1940 on Treasure Island in San Francisco and full of detail about swing bands (of course), the world's fair, prohibition, and other things that I can't mention without spoiling the plot. I've honestly not read a mystery in a very long time that does such a fine job of holding my interest on every page. Although it's a page turner, this isn't a book that you read quickly to find out who dunnit. You'll enjoy each and every sentence. And the writing is tight. Everything matters. Nothing is filler. Run to the library today!!! Also... the author is a composer among other things and you can dowload the score to the book at www.rupertholmes.com - complete with musical clues. And he's serious, there are musical clues.